“Where are your people from? After months of watching shows like “Who Do You Think You Are” and “Finding Your Roots” where Dr. Henry Louis Gates traces the ancestral backgrounds of celebrities, I’ve been curious about my ancestry but never really motivated to to an active search. In high school, my history teacher assigned us a project to trace our ancestry and I was only able to go as far back as my great-grandparents on my mom’s side. My father’s side I was able to go back another generation or two, but not much further. I can’t imagine how Alex Haley was able to trace his family all the way back to Africa all those years ago. Especially without the DNA technology we have now. I would’ve had no idea where to start or even how to go about it. 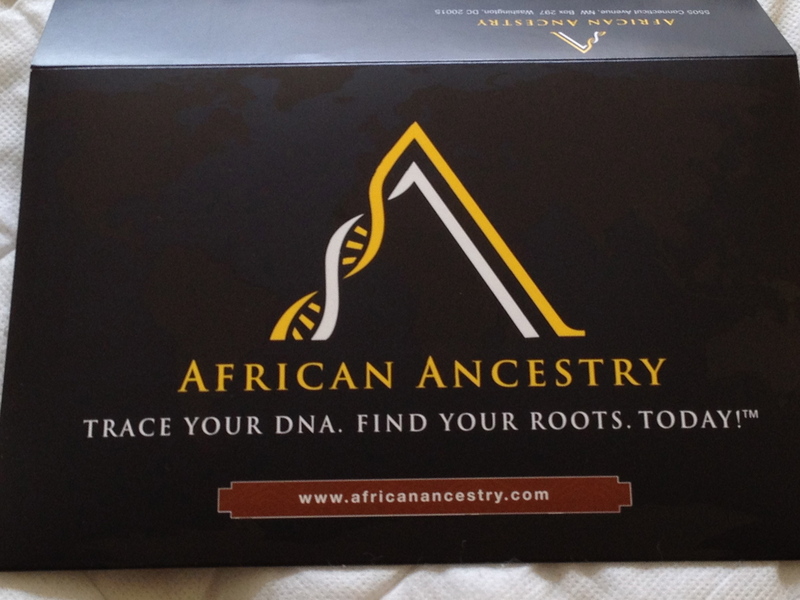 The impetus came when a friend posted on facebook that africanancestry.com was having a sale on the ancestry kits. A $100 savings off the regular cost was enough motivation to get me started. Tracing my maternal side was no big deal. To trace my paternal ancestry, there was a little bit of a problem. Because the “patrilineal” kit uses DNA that is passed from father to son only, it requires a male descendant to take the exam. Since my father is deceased and I don’t have any brothers, I reached out to one of my male cousins who agreed to do the DNA test for me. Inside each kit was a brochure on the testing process, a consent form to submit the DNA sample, 3 cotton swabs, a storage envelope for the samples and a return envelope to mail the samples back. The instructions were straightforward. Simply swab each side of your cheeks with 3 the cotton swabs then place in the accompanying envelope and mail your samples back. Then in about six weeks you’ll be sent a certificate with your DNA results. I used to sometimes envy folks who could hyphenate their ethnicities. Yes, there is “African-American” but Africa is a continent, and that’s not the same as knowing the actual country of origin. I’m named after an african country and over the years have been asked thousands of times if I’m from that nation. I’ve had numerous African women braiders from various countries have told me I look like their people. I really have no idea from what country or what tribe I’ll end up from. I’m just glad I’ll be able to finally have that question answered. India.Arie may not have had that in mind when she wrote her lyrics, but she now knows where’s she from. Previous my natural hair story Next Words With Friends Racist? I can’t wait to hear what you find!!! I had a woman chase me down 125th Street because she was sure I was her cousin from Cameroon! It was only when she realised that I didn’t speak Cameroonian French that she believed me. We had a wonderful conversation about the country and how much she believed my lineage came from there.